@BastilaBey wrote: @vaderito "Are you an angel?" You know I love me some Office in Space, so this kind of makes perfect sense. There are plenty of examples of ambitious people in history/politics/business coming from that background who rise hard and fast because they have something to prove. Hux is the ruthless striver whose ambition is fueled by the need to prove himself good enough, despite his father's early judgement and the stigma of not being 'legitimate.' He's not content with being part of the status quo, he's going to be the status quo and crush anybody who gets in his way. I seriously would watch 2 hours of those two space brats throwing shade at each other in front of big evil Space David Brent, who pits them against each other. Also makes sense for him even more having it in for Ren as a rival, who's the actual legitimate heir with some serious lineage cred. If the rumors are true about Space Mom ending up in coma thanks to an ambush, how much you wanna bet that Hux is behind that? And he's already been pretty snide about the 'the guuuurrrl,' so if he threatens the other lady Ren's sweet on, it's gonna be all out war between those two. @panki wrote: I wonder whether Doctor Aphra is a non-FS retcon of Mara Jade.... she works in secret for Vader and she is tasked with pursuing Luke.... she is very resourceful, smart talking and a good fighter..... here is my crack theory .... Aphra and Luke had a child but the child isn't FS and someone anyone would guess- Jessika Pava (Luke is her hero and takes a lot of interest in hearing stories about him in Weapon of a Jedi) ...or maybe KMT? @panki Mara has certainly inspired many of the female characters in the new canon. Would not be surprised if Jyn has her snark. Heck even Winter inspired Leia's new blond handmaiden and friend lol! Interesting theory but... I want Luke and Mara back together rofl! But I don't think Luke being Jessika or KMT;s father would work as they're Asian and he's white. Doctor Aphra has asian looks and Jessika Henwick who plays Jessika Pava is half white and half asian....so she would definitely work for my crack theory. Ah! I think you're on to something @panki! I’m also pretty sure Snoke features at the end of this book! 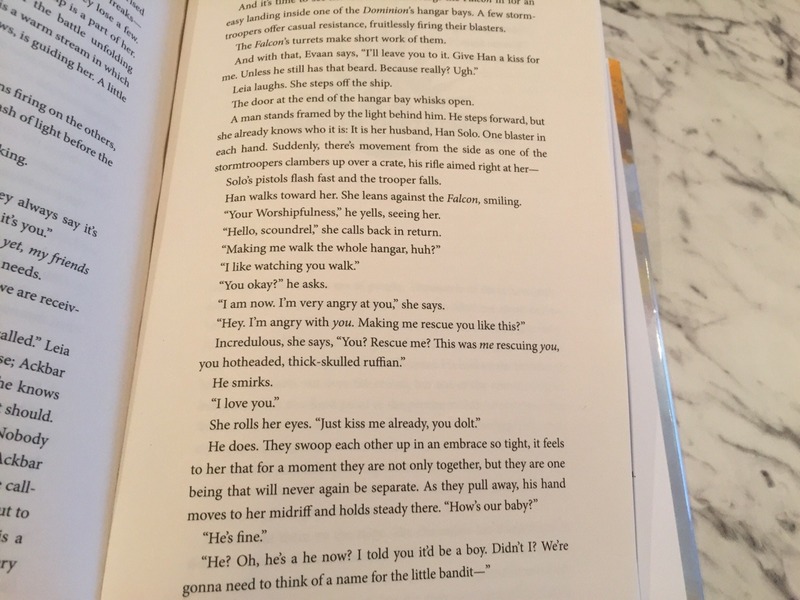 If anyone wants to see that then let me know … I don’t want to spoil the book for anyone, so please tag it as spoilers. Thanks. But this is such an awesome read so far!! Pablo is sometimes a real King! Why is this significant at all? Why does it matter? Why give Hux any back story at all? Ah, the plot thickens and it's already thick as tar. @Xylo Ren wrote: So what can we take away from this? I'm guessing it doesn't matter, otherwise it'd be kept locked tight for a movie reveal? 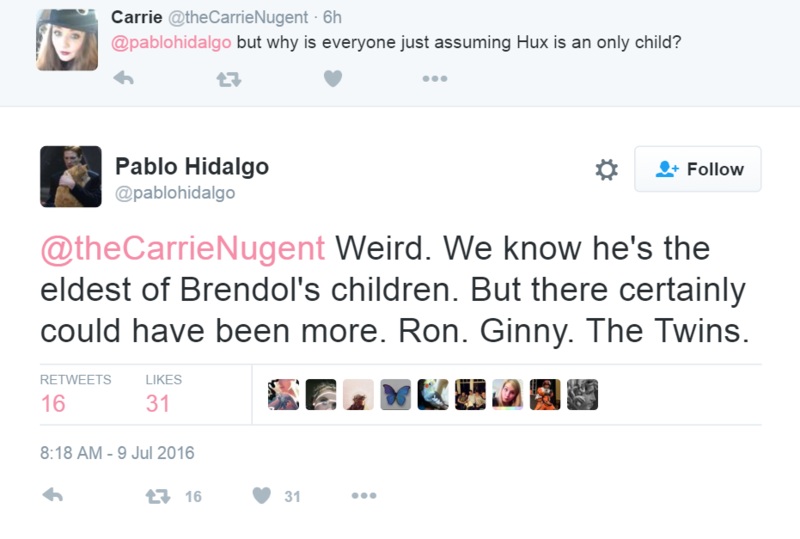 I actually remember Pablo saying Hux would be getting a first name in episode 8. I'm quite enjoying finding out more character backstories and I do have a soft spot for Hux (mainly because of Domnhall Gleeson). I never really read much of the EU stuff so it's not like any of this is rewriting history for me. What can we take away from all this? - Not much in terms of the movies, I don't think. According to Pablo Hidalgo and others, the movies will always have the final word on character and story. These books and other supplementary materials like the comics are really just filling in the blanks for the more devoted fans. The book buying/reading audience is only a tiny fraction of the movie audience. There may be things that originate in the books and TV shows that transfer over to the movies, but they will probably keep such things limited. General Hux has become a popular character and Brendol Hux has already been mentioned in two other books (as far as I'm aware) Bloodline (brief mention) and Servants of The Empire: The Secret Academy (as a minor antagonist). I don't see any harm in fleshing out his character a little in this form. Hitler was a child once! I actually really like how they are making things less black and white and good versus evil in the new Star Wars universe. Bloodline was great for all the political scheming and showing how people rightly or wrongly fight for a cause that they wholeheartedly believe in. Maybe some people prefer simplicity, but in this day and age, I don't think it hurts to get people questioning the motives of both sides. I don't think Pablo ever specified when and where Hux would be getting a first name, only that he would be getting one. Yeah,I mother be wrong about this but didn't he say something like how his name wasn't Brendol Hux Jr.and that he would be getting a name which I took as that we'll find out what his first name is since we know his surname already. Yes, he did say something like that. I think people just assumed we would find out Hux's name in Ep 8 because the contents of this book weren't known about then. I don't see it as being a problem in any way. General Hux might never even be referred to by his first name in the movies. It's just a nice bit of extra information as his name does speak to the kind of man he's grown into, I think. It's a bit like that Johnny Cash song, A Boy Named Sue, where the boy learns how to fight and be strong because he was given such a terrible name! Jakku "was significant to the Galaxy a thousand years ago, and will be significant again." His name name is Gallius Rax and he's a Fleet Admiral who used to be in Palpatine's circle and tells Brendol Hux that "The Empire needs children." This makes me think Rey might have been one of these children. Empire needs children who are born at the time of need. Rey was born well after Empire fell. So most immediate child to be born is Ben, who may have been born as half Dark half Light because of the balance of the Force. As for Palpatine's hint that Jakku will be significant, that does sound like a nod to Rey, though not necessarily that she is a Palpatine. We know that he was gifted in foresight. However, thousand years ago is when Sith was defeated. So is the implication that Sith was defeated on jakku or that it was based on jakku? Which brings us to another question. lets say Rey's parents were dark, could they have been hunted by Luke and his acolytes? We don't know what they were doing. Assumption was they were relic and lore hunters but was that all? Speaking of names, I wonder if we'll get discussion of what Benjamin Chewbacca's last name will be. And if Luke and his acolytes were on the hunt for Dark Siders, surely a 15 year old Ben would have felt compassion for a little girl and taken it upon himself to hide her. It's possible that while Rey may not be a Palpatine her parents could very well be Imperials who were rebuilding the FO.I mean the FO has been kidnapping children and training them as Stormtroopers for years so they might have hoped Rey to be one of those children the Empire will need. The theory about Luke and his acolytes hunting down Imperials/DS is really interesting because in Rey's vision young Rey is suppose to be wearing war clothes(as revealed by the young actress playing her)so maybe they were battling Luke? I have a feeling Rey's being on Jakku might be related to Brendo Hux and co's legacy.... wasn't there a tweet by PH about potentially force sensitive children being kidnapped during the empire and if they don't show abilities, they got killed... or something like that? Going back to a clone wars cartoon, there was an episode where Palpatine stole a holocron containing the names of all the potential force sensitive children and tried to kidnap them to train from a young age.. he almost succeeded in a couple of cases (Pipey and Alora) but the jedi rescued them. During the time of the Empire, force sensitive children would mysteriously disappear and never be heard of again. The inquisitors would train these children to become dark side users and join their ranks. Dhara Leonis was kidnapped for this program but her brother Zare helped her escape. Now I wonder if someone tried to revive this program in the FO and kidnapped children to test for FS abilities....what would be interesting is if the people kidnapping the children knew those children descended from certain jedi/sith/other FS bloodlines... then Rey's parents might still be alive somewhere and she could still meet them by episode 9. I don't think they would make Luke evil enough to kill Rey's parents .....but what if Luke kept a record of potential force sensitive children based on their bloodline and who he was meant to collect for his order as they got older and someone gave this record to the FO? Maybe someone like LST? That is so disturbing. It really drives home what TFA appeared to present, that the younger generation's childhoods have all been taken away by the realities of war. Finn, Rey, Ben, even Hux. I have to admit, my sympathy for Hux is still rather limited because he doesn't display an ounce of conflict in Vii. But who knows, he might in the next movie. I do appreciate that they've been moving in a more morally grey area with the books like Lost Stars humanizing those on 'the wrong side' so maybe Hux will turn out to be a tragic sympathetic character, even in his ruthlessness. Rey being left on Jakku because she might have been taken by the FO bodes well for the theory that her and Kylo could end up joining together to take on Snoke. They'd both realize that he was targeting FS children for his own means. Rey could have been Kylo, had Snoke got his claws into her. If they were stealing FS kids than they wouldn't have a huge army cause FS don't grow on trees. And that leads to "Finn = FS after all" which we know is not the direction they are taking. You can't do "Finn isn't FS, it's Rey...oh, wait, he is too". Pablo said there were no indication that he was FS and explained that voices were voices/screams from Maz castle.